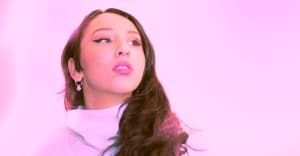 French independent artist Ta-Ra (FKA Ta-Ha) spent part of her early 20s living in Japan, and the culture left an indelible influence on her bedroom R&B. She flexed with friends in Tokyo for 2015’s “Lil Bit” video, and flipped between singing in English and Japanese on last year’s trap ballad “Death Ray.” Her new video for the revved-up “Kawasaki Ninja” — originally from 2016 EP SunrayZ — puts a fantastical twist on those themes. Shots flip between Ta-Ra playing the gangster moll with a group of bikers in Yokohama streets, and lounging in a blue-lit hotel room as she waits for her tatted-up lover to call.